Remember when the Guru’s of yesterday said, “You’re not Coca Cola, IBM, or Apple, Don’t hire a Madison Avenue Agency to do a branding campaign that can’t produce immediate measurable results. You can’t compete with them, you need repetitive exposure, blah, blah, blah” ? Nowadays, everyone preaches the importance of establishing credibility, connecting with your customers, getting engagement, providing value and service before asking for the sale, and that’s true, and takes time to accomplish. Statistics indicate that a quarter of the planet is connected to the Internet and in five years that number will rise to 75%, with mobile apps being the next big wave. If you want to stay ahead of the curve, you do a social media campaign now and integrate mobile technology. To do all of this correctly requires you to constantly be in front of your audience. You have to blog, tweet, post to Facebook, give away value and content nearly every day, gain trust and relationships with your customers, drip them content, and hopefully get them to buy. Your Tweet and your Facebook post appear to them with thousands of others. In a matter of seconds, it’s flashed by and if you don’t have a compelling hook to get them to click and read more, they’re gone. Even if you do, even if they trust you and like what you have to say, at the push of a button they will be off your page reading someone else material. In fact, they probably have it scrolling by in another window while they are reading yours. What else are you looking at right now besides this blog post? Internet ADD is common. I’m not saying you shouldn’t do all these things — It is the wave of the future. Here in the US the number of connected people is much higher than 25%, but does that mean you should ignore those that aren’t? The folks that are connected still have Mailboxes in addition to their Inbox, and guess what? They aren’t being flooded by your competitors! On the order form I have a fill in for email address. I specifically tell them their information will not be shared. If they have an email address, fill it in so that when their order is received I can send over a quick confirmation letting them know it has been received and is being processed. Pretty harmless right? I’m asking for an email address AFTER they’ve decided to buy just to let them know the US Postal Service did its job and their money has arrived at my office. The surprising fact — Over 70% of them hand write “Not Online”, “No Email Address”, “A zero with a slash through it”. No one has ever wrote, “I’m not giving it to you, I don’t want to be spammed”. These people simply aren’t online and would have never known about my offer if I didn’t mail it to them. With higher end lists where the predominance of the recipients are online, my close ratio is much higher through direct mail than it is online. I have zero competition in their Mailbox but probably aren’t even making it into their Inbox. Yes, the folks that are on the Internet will go out and Google you when they get a letter in the mail, but if they haven’t found you yet through social media and a mailed letter or postcard gets them into your online funnel, then surely you now have an additional prospect in an already developed system that wouldn’t have got there. It served its purpose. Here’s the secret: All of the steps for a successful social media/online campaign hold true BUT you can do all of them using direct mail with a well-written salesletter AND close your prospect in one or two steps with a targeted direct mail campaign. When a prospect gets my letter in the mail, chances are, that is all they are reading at the time. I am not competing with anyone else trying to flood them with information at the same time. The photo in this blog post is an actual picture of one’s days worth of responses. Yes, a stack of mail from people sending me money for my book and another item being sold at an average cost of $437. Direct Mail is NOT Dead. It is as profitable now as it was back in 1987 and rarely anyone uses it. And as for other Direct Response channels that involve higher cost, friends in the industry tell me they are still effective. QVC and HSN have not gone off the air and if you see the same infomercials running over and over, doesn’t that tell you something? Coming Soon: “Your Inbox is Full, But Your Mailbox Ain’t: How to Sell Anything, Including Your Book, High-Ticket Item or Network Marketing Program Through Direct Mail With Zero Competition”. If you aren’t on my list for updates, now would be a good time to fill out the form on the sidebar of this page. Please Tweet, Share, And Comment! Looking at that stack of letters in the photo, I’m convinced that I need to start thinking seriously about doing direct mail marketing. My dad is one of those people who are simply not online and plan to keep it that way, and he regularly orders from catalogs that he gets in the mail. Your post really has me thinking about this group of customers. And I can see how people who are not online might very well be a good market for books–they would rather read a book than read info on the internet! As an author, I am pretty inspired by this post. If you have advice about where to get started in terms of finding a good mailing list for direct mail, I’d love to hear it. A list broker is the only way to get responsive names. My recommendation would depend on what you are trying to sell. Thanks, Mike. I appreciate your reply. I did a little googling and saw some interesting organizations who rent out their lists. Now googling “list broker” I am finding some other good results. Honestly I am not yet sure what would be the best product for me to work on. My strength is in content writing, and I have thought about putting together some how-to type of nonfiction books related to creative writing, publishing, and other topics. I recently joined an affiliate program where all I do is hand out flyers to local small businesses in my community. Most times I am leaving the flyer with an employee. It’s a flyer that prompts the business owner to either call an 800# or go to a website. This offer is in the credit card processing industry. It’s an offer for small business merchants to get lower rates and cash back from their merchant account. Do you think this business is a good candidate for direct mail campaigns? It depends. Since you have face to face contact with local businesses, how is your conversion? 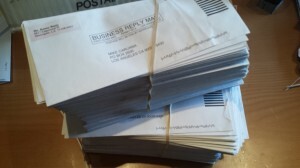 If it is good, I would suggest doing direct mail to ramp it up and add some numbers. If not, work on that first. Hey Mike! I was browsing around doing some research and found your site. Nice site btw! I love how in your message you talked about your mailbox competition vs. your online competition. I can defiantly see the true value in that for sure. I have tried online marketing and it works don’t get me wrong, but I feel like sometimes it takes forever to generate any real type of tangible reward. At least with a direct mailer I know when to expect an influx of calls and where they are being generated from. Most marketers only think on-line when it comes to putting your offer in front of an audience, but a direct mail campaign, when executed correctly, will continue to bring you sales and profits over and over again. I started out with a brick and mortar company and expanded on-line, but I never stopped the physical contact – print ads, mailings, meetings, etc. and it’s served me very well. Keep the info coming Mike, it’s great to connect with another who sees the whole picture.